Computer program Peresvet Homeopathy greatly reduces repertorisation time, saves much labor and also uses original methods based on computer technology. What are components of the Program? 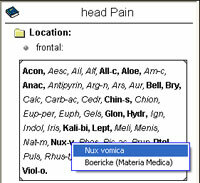 REPERTORY based on Boericke data contains more than 10,000 symptoms, therapeutic index and a system of the symptom search using key words and names of remedies. ANALYTIC SYSTEM realizing principles of traditional repertorisation. 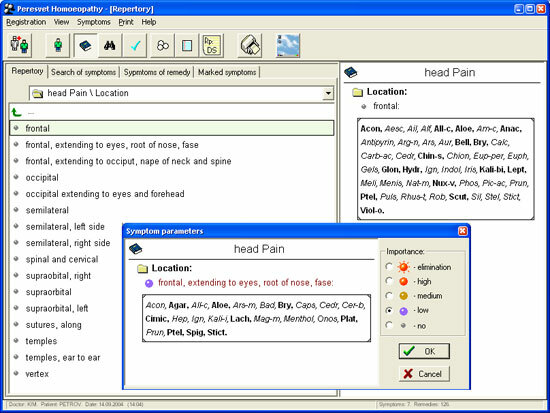 Integrated estimation of 1200 remedies considering seriousness of a symptom and the Repertory`s mark. 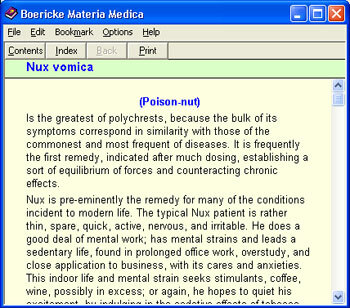 MATERIA MEDICA containing pharmacodynamic of more than 800 remedies. SYNTHESIZED REFERENCE DIRECTORY for different nosologic forms, instructions for remedies compatibility, application and dosage of homeopathic remedies. COMPARISON OF ALL PATIENT`S VISITS allowing to monitor dynamics of a patient`s state and remedies prescriptions. What are advantages of the Peresvet Homeopathy? В¤ The program has a standard mode of displaying the headings as in Repertory book. В¤ Repertorisation remedies are offered for top-priority testing by "Peresvet Voll" module. В¤ All program outcomes are visually expressive, simple and intuitively understandable for users of every qualification. В¤ Automatic Registration and filing of all examination results by the Program that the doctor to be free from storing numerous papers. В¤ Printing-out examination results, conclusions and prescriptions edited by the physician.